Saturday, May 25th in 2013 was a hard day for British football fans (for the Americans out there: when I talk about football it’s what you call “soccer”): Two German teams – Bayern Munich and Borussia Dortmund – reached the Champions League final (which can be compared to the Super Bowl), both of them peppered with young players, but also with some older experienced hands. The first exclusively German final was ironically held in London’s Wembley Stadium which must have been a blow for the British fans considering the never-ending rivalry between British and German clubs, national teams and supporters, all the more because the British had to face an invasion of thousands of Germans. But invasions don’t have to be like that: For those Germans who like free improvised music the fact that the crème de la crème of British improvisers invaded Berlin to bring some of the finest music across the Channel was one of the concert highlights in 2011. Now those who were not as lucky as the chosen ones who could be there can now listen to a well chosen selection of the performances that took place between 6th to 8th October at the HFC (the former Hungarian House). What is even more, the music is presented in an exquisite box set that brings back memories of the legendary FMP releases (Cecil Taylor Live in Berlin 1988, FMP in Retrospect, Workshop Freie Music 1969 – 1978, Jazz aus der DDR) and the Total Music Meetings (TTMs). The connection here is Helma Schleif, who took over FMP from Jost Gebers when he decided to retire in 1999/2000. Unfortunately, the transition from Gebers to her did not go smoothly (actually it was an acrimonious argument and from my outside position I dare not say which one was right). In spite of dramatic financial cuts as to subsidies for the festival Schleif managed to organize eight more TTMs until 2008 but eventually she had to give up because the Berlin Senate stopped the support completely (considering that a left-wing council was responsible, it is a disgrace). This festival Schleif curated with British saxophonist Tony Bevan and Luxembourgian film maker Antoine Prum (who made a very nice documentary about Sunny Murray and has started working on a film about the British free jazz scene). All in all they organized 22 concerts trying to bring three generations together – the first one around Trevor Watts, Lol Coxhill, Phil Minton and Eddie Prévost, the second one around musicians like Bevan himself or John Edwards and the new one with people like Dominic Lash or Gail Brand (you can see the complete list below). You get an idea what the festival was about when you listen to the two quintets on the second LP. Both groups have a rock solid old school rhythm section consisting of Edwards/Prévost respectively Edwards/Sanders, the first group being a true old generation band (with Coxhill, Watts and Minton) while the second one presents the young guns (Tom Arthurs, Shabaka Hutchings and Alex Ward). And even if the classic group is absolutely great (I haven’t heard Minton in such excellent form for a long time) it is the young meeting the old which is the more fascinating one – you can literally feel the joy they had interacting, their constant state of surprise, like a young couple discovering their bodies, the feelings carrying them away. Imagine you are in the middle of a chase with ricocheting bullets (sax, trumpet) all around you, which are then torn to pieces by a relentless guitar. It is a sensual experience. But basically the trios created the most interesting results, e.g. the one with Steve Beresford, Gail Brand and John Edwards in which the two veteran performers prepare a wide sound space for Brand whose lush trombone lines meander on tiptoes around piano sprinkles and bass pizzicatos. Another highlight is the trio of Tom Arthurs, Steve Beresford and Matthew Bourne in which the young Bourne puts the interior of his piano through the mill with a water bottle, never touching the keys of his instrument but therefore spilling a lot of water while Beresford added electronic shredder. Tom Arthurs seems to enjoy the dialogue, he only contributes some sparse gargling which is just the icing on the cake. Finally, the heavyweight trio of two contrabasses and a bass saxophone (Bevan/Lash/Edwards) creeps in your bones like a monster in the dream of an innocent child. After two minutes they stop simultaneously to create a marvelous moment of silence only to come back even spookier. A track which definitely works as a horror film soundtrack. There is a delicate note in the fact that the festival was not the centerpiece of the Berlin senate’s cultural funding but “only” a side project of a documentary. Prum filmed the whole festival and he used Luxembourgian public film funding to realize the project. He wants to ask the question if there is a specific British element in free improvisation and what the different generations might have in common. The festival created situations in which something new was possible, even failure was part of the concept. The LPs are already great – we are now looking forward to the documentary. I am very much a fan of British free jazz, and have this box set, which I am enjoying considerably. However, a though occurred to me, that this music has seen its apotheosis, and already seems a thing of the past. The creative force is spent. Like the light we receive from stars, what we are getting are the emanations of the past, of Derek Bailey, John Stevens, SME, et al. It's sad, but I think it's true. I may be wrong, and I hope I am wrong, but listening to this set made me think of a precious object, carefully protected in a museum setting. The star will continue to dispense its energy, but you know the creative explosions have already happened. 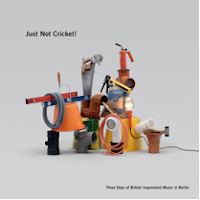 You are not alone in thinking that - this is an issue I address in my review of “Just Not Cricket!”, which will be posted tomorrow. I'm really not sure that I can agree with AGM and Colin Green on this. Obviously, I worship the 'First Generation' players, which is why I wrote a book on 'em. But from what I can see, certainly in London,the audiences are getting bigger and more mixed in terms of gender, which can only be welcomed in this previously rather elitist, male-dominated arena. The 'shock of the new' has been lost, as the music is now 50 years young. However, many of the younger players (and I would include players like John Edwards, Mark Sanders and Steve Noble here) are incredibly creative and versatile. Alexander Hawkins is a world-class free improvising pianist, and players like Jason Yarde, Shabaka Hutchens, Gayle Brand, Matt Bourne, and Dominic Lash are going from strength to strength on the live circuit. The concept of a 'Golden Age' is fraught with difficulties, as I try to point out in my book. We have to be careful not to forget some of the less marvellous manifestations of that time, in a tendency to focus on the creation myths. I'd rather be lapping up the incredible diversity on offer at Cafe Oto every night, than numbing my bum on the bleachers of the Little Theatre Club, to be frank, however romantic the latter may look through the mists of time. This is an very interesting debate, and needs further thought from free music fans. I'll be very interested to hear other opinions. Just to be clear, my comment said that my review (which had been written but not yet posted) would discuss the view expressed by AGM, not that I agreed with him. It’s clear from my review that I take a different position, in fact one that is along similar lines to your own. As to the term “Golden Age”, I was puzzled by its use in your book, though I’ve only read the first edition, not the second. It’s used to refer to a period or era in which a particularly high standard was reached, followed by a decline, for example: the Dutch Golden Age of painting. Since you acknowledge in your book that there was no decline in the quality of the music after the period you cover, it’s difficult to see how it would qualify as a “Golden Age” within the accepted meaning of the term. The music changed with the input of the Second Generation (which I compare to the Silver Age of Marvel Comics in my next book). We clearly disagree as to what a Golden Age means, Colin. In fact, both Evan Parker and Derek Bailey made their greatest recordings, imho, during the (notional) post-Golden Age years. The Golden Age trope is a quantitative rather than a qualitative, measure, at least as far as I use the term. But, more to the point, where was Evan himself in this film? When I asked him, he gave a typically gnomic response, somewhat along the line of "I wasn't asked", which I find hard to believe.